About time for another post, and I’m going to keep this one brief. The first year of CityLIS was over too soon and I’m now glad to be back, though a little apprehensive at the extra work to be done in this second and final year (yes, the dissertation). I got good marks in my assignments, which has given me some confidence, but the long break from the end of May to the beginning of October has been enough to dilute that a bit. Thankfully, my practical library experience has been given a big boost in that period as, in June, I was offered a part-time library assistant post at Reading Central Library, where I have been volunteering since the start of the course. I only cover peak times (11am-3pm) on Saturdays but it is solidly busy work on the ground floor desk (children’s; adult fiction; foreign-language fiction; large print; audiobooks, DVDs and CDs). There have been a lot of processes and procedures (written and unwritten) to learn, but I feel I’m getting the hang of it and I am certainly enjoying it. Thanks to the volunteering stints I did on the first floor, I am also occasionally posted there. This is the main non-fiction/reference/computer floor, with a rather different customers and demands. Working in a public library is a clear lesson in how useful such services are to different parts of the community. Recently, I have spent time helping a man, not much older than myself, who needed to use a computer to fulfil the requirements of a training course he had attended, though he had absolutely no IT experience. Another library user encountered on my last shift came up to the desk every so often and asked how to spell words he needed for something he was writing. ‘Caught,’ as in cricket or ‘Court,’ as in judge, I asked. ‘Court as in judge,’ he replied. I have some ideas for my dissertation but plan to think them through more rigorously before approaching one of the lecturers for feedback. Watch this space (but don’t hold your breath). Thankfully, one of this semester’s modules (Research, Evaluation and Communication Skills) is dedicated to setting us up for the whole task of researching and writing a new topic in depth. The other – Information Management and Policy, is proving to be an interesting study of the way that information is considered and managed in a broader context than the library, particularly the commercial world. 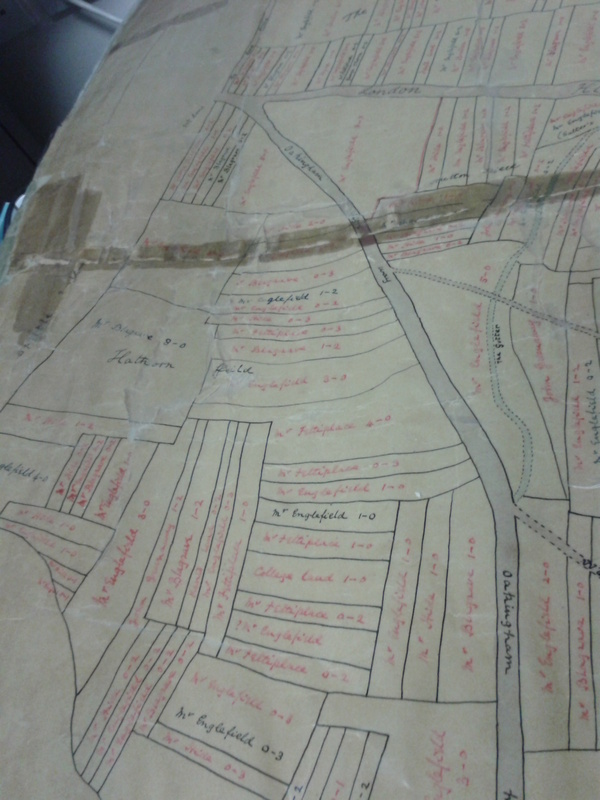 I end with a photo of one of the historical maps from the library strongroom I have been cataloguing. It shows the fields that lay under the part of Reading in which I now live, near to Cemetery Junction, which is the fork in the road you can see towards the top left. It’s dated 1669.